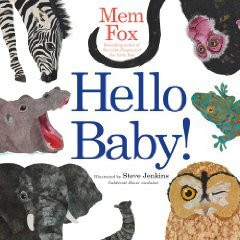 ﻿ Sonderbooks Book Review of Hello Baby! Perhaps you're a porcupine, twitching its nose. Perhaps you're a gecko with rolling eyes. But what makes this book stunning and unforgettable are the incredibly detailed cut-paper illustrations by Steve Jenkins. I've raved about his illustrations before, in my reviews of Actual Size and Dogs and Cats. They only seem to get better with each new book. When I saw Hello Baby! I had to pass it around to my co-workers to watch them marvel as well. He makes cut paper look alive. Then who are you, baby? I like the way they made the hands reaching out to each other a range of colors, so you can see almost anyone's hue there. That's one place it doesn't look as lifelike, because no real person's hand has all those colors, but the use of mottled paper in that place works so that it could apply to anyone.